We played the 1st Maelstrom of War mission which was our first experience of the new 7th edition mission set. It was a great warm up game, my first battle using my Imperial Knight and he helped secure a result in my favour. Lysander and the Imperial Knight were immense and won the game for me. This was the main event. 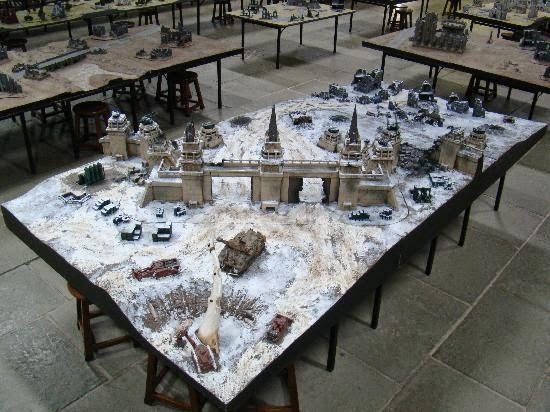 We calculated that between us it would be possible to field 5k points of fully painted models on each side. I went with my Space Marines and Imperial Knight and used my friends Grey Knights and his Imperial Knight. We set up the board so that my forces were defending the fortress and my opponent was tasked with capturing the control points which we positioned around the walls/inner points of interest.